To: Crecente From: Bashcraft RE: Burning Up! Edgar Allan Poe is a conundrum. I don't mean the writer (though he certainly had his share of problems). No I mean our Great Dane... or whatever he is. Ever since we adopted him people have been asking us exactly what he is. 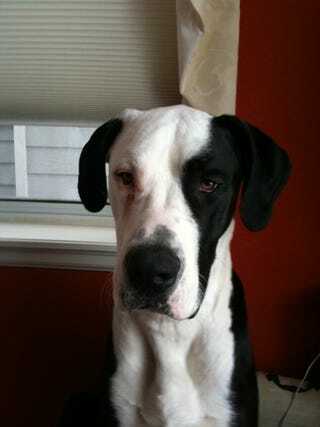 At 110 pounds he's a bit small for a Great Dane, but his giant hippo head is certainly too big for one. People have suggested that he is part pit bull, part Mastif. I thought he was part hippo. We were all wrong. A couple of weeks back, no longer able to put up without knowing, we had a blood sample taken and sent it off to a lab for DNA testing. Left 4 Dead 2's The Passing Introduces Weekly Game "Mutations"
So about the breeding. Turns out that Poe is about a third Great Dane, a third bulldog and a third... miniature long-haired dachshund. Yes, our 110 pound Great Dane is part mini dog. How did it happen? Poe's not saying, but I'm sure alcohol was involved. So what would that make him? A Great Boxie Doxie? A Bully Dock Dane? A Dane Bull Doxie?